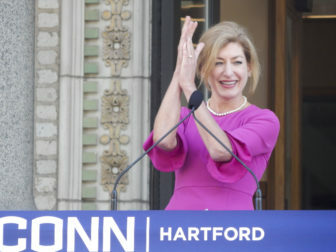 UConn President Susan Herbst claps during the opening ceremony at the new Hartford campus last year. Susan Herbst told the University of Connecticut community in an email Monday she will step down next summer after eight years as the 15th president of the state’s flagship university, a tumultuous time of dealing with budget constraints. After she steps down, she will resume teaching. She will stay on the UConn faculty, teaching at a Stamford campus that grew during her tenure, adding student housing. Herbst, who is the first woman to lead the university since its founding in 1881, was selected in December 2010 — potentially an awkward time, just a month of the election of Gov. Dannel P. Malloy. But the administration of his predecessor, Gov. M. Jodi Rell, had kept Malloy informed of the selection. The president is appointed by the Board of Trustees, not the governor, but no president of a state university wants to take office at odds with a new governor, who serves as ex officio head of the board. Both Rell and Malloy met with Herbst and endorsed her selection. Similarly, the search for a new president will begin in the final months of another governor’s term, with applicants uncertain who will be the next governor or what the be the new administration’s attitude towards financial support of UConn. Malloy had tried to shield from UConn from deep cuts, vetoing one Republican-crafted budget that he deemed disastrous to public higher education. Tim Herbst, one of the three candidates for governor guaranteed a place on the August primary ballot, made Susan Herbst’s resistance to budget cuts a campaign issue in January, saying he would seek her dismissal and the appointment of a new board. Those are comments that applicants are likely to note. UConn made a major commitment to bioscience under Herbst, continued the modernization of the Storrs campus and opened a new campus in downtown Hartford in 2017, closing an aging satellite facility in West Hartford. Malloy said she will leave an “indelible mark” on UConn. The school’s ranking among public research universities in the U.S. News survey has risen from 26 to 18. Its endowment grew from $272.3 million to $421.8 million, with a goal of $1 billion set by Herbst. Lawrence D. McHugh, who was the board chairman when Herbst was selected in 2010 and through much of her tenure, was lavish in his praise. “Susan has been one of the best presidents in the university’s history and hiring her is one of the most important and far-reaching decisions we made as a board,” McHugh said. “Her contributions have been powerful and lasting. She led the place with a fierce determination to drive UConn higher and higher academically, to expand the faculty, focus on student success, build outstanding facilities, and to do all she could to ensure UConn grew and thrived. She had her difficulties with the legislature over a variety of issues, ranging from generous pay increase granted to her by the trustees in 2014, a controversy over the school’s handling of sexual assaults at the main campus in Storrs, and the closure of a satellite in Torrington. In 2014, the university’s governing board voted to increase Herbst’s annual compensation to $831,070 by 2019 — a 60 percent boost in the eight years she has run the school. Her contract was also extended by three years to 2019. The same year, the school agreed to pay nearly $1.3 million to settle a lawsuit filed by five current and former students over the university’s handling of sexual assault allegations. The agreement, released through a joint statement by UConn and the plaintiffs, also stipulates that UConn admits no wrongdoing and denies the allegations against it. Herbst’s original response to the allegations struck some as tone-deaf — focused on protecting the university’s reputation, not reassuring parents and students. The search process will be mindful of the political calendar. Kruger said he would appoint a committee of faculty, staff, students, alumni, and trustees this summer to begin a national search. It will be managed by Rachel Rubin, the university’s chief of staff and executive secretary to the board, and Michael Kirk, the deputy chief of staff. The committee’s goal will be to select finalists in the fall. As was the case in 2010, the board would seek the involvement of the outgoing and incoming governor. Malloy, whose administration lured Jackson Labs, a leader in genomic research, to a Connecticut near the UConn Health campus in Farmington, viewed Herbst as a partner. “UConn is making its mark as a top-flight center for research thanks to forward-thinking, new partnerships with the state, including Next Generation Connecticut and Bioscience Connecticut – historic investments that have attracted companies like Jackson Labs, grown good-paying jobs for our residents, and turned our state into a bioscience hub,” Malloy said.